I’m done with school for the semester – no more papers or tests or studying for a month! To celebrate, today’s prize is another $5 Amazon gift card. There’s no thing like books for the holidays! 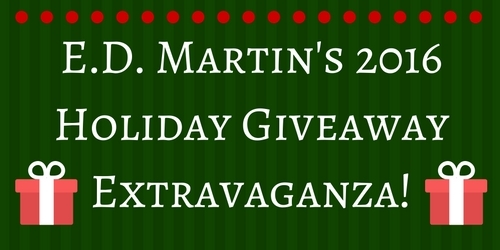 And you’ll be able to get your favorites with today’s giveaway of a $5 Amazon gift card. I’ll be home for Christmas; you can plan on me. There’ll be books, for Kindles and Nooks, and lots of swag under your tree. Six stories about the problems teenagers face, from relationships and unplanned pregnancy, to absent parents and poverty, loosely based on stories and students E.D. Martin encountered while teaching at-risk kids. You will get a sentimental feeling when you read, veterans’ and their PTSD affecting their friends and family. Told from the points of view of spouses and children as well as the soldiers themselves, the stories tackle eleven different scenarios spanning five American wars. Guilt and acceptance, despair and hope, selfishness and sacrifice, and above all, love, blend together as characters come to realize maybe their feelings aren’t futile after all. You don’t want a lot for Christmas; there is just one thing you need – and you can get it if you win today’s giveaway, which is a $5 Amazon gift card!